Perfect for everything from swim training and regular pool sessions to holidays and fun at the beach, these FunAqua boys Palms trunks are extremely comfortable and long-lasting. 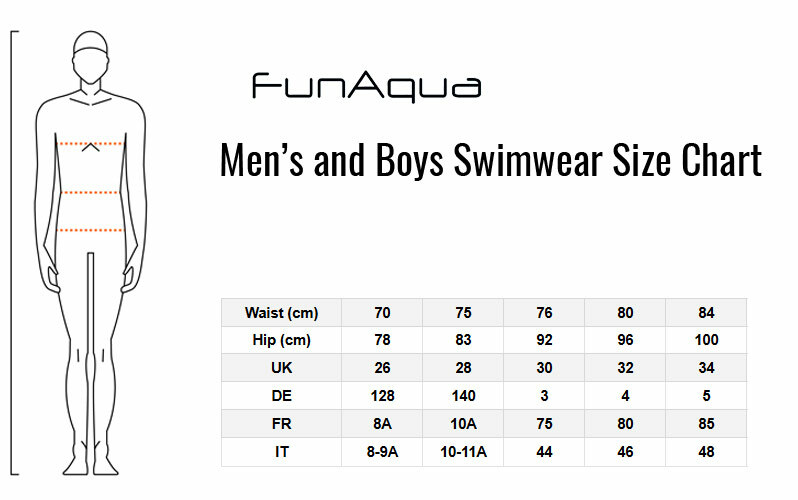 Made from a high quality chlorine-resistant fabric with excellent UV protection, these swimming trunks will keep FunAqua's Palms pattern looking bright and colourful for longer while retaining their shape and fit even after countless hours in the water. These FunAqua boys Palms trunks are a perfect choice for any swimmer seeking a fun and fashionable new look at the pool or the beach. A versatile choice, these swimming trunks will perform at their best no matter what the occasion. Whether it's long training sessions, regular pool sessions or fun on holiday, they will provide exceptional comfort and support time and time again. Featuring a fashionable new tropical-inspired Palms pattern which is part of FunAqua's newest design range, they are made from a high quality polyester fabric which is chlorine-resistant and offers excellent UV protection. This material is also extremely durable, helping the swimming trunks to retain their bright and vibrant appearance while looking and feeling as good as new for longer. Fun, bright, long-lasting and quick-drying, the FunAqua Palms trunks are a great choice for any swimming activity.